Copyright Conumdrums - How Long will the original Godzilla be Protected by Copyright? The film Godzilla (Gojira) was first released to theaters in Japan on November 3, 1954. An authorized Americanized version with dubbed dialogue, reediting and the addition of Western actors, entitled Godzilla, King of the Monsters!, premiered in United States theaters on April 26, 1956. In this article, I will illustrate how to determine the copyright protection term for a foreign film and some of the difficulties that can arise with determining the length of the copyright term. Copyright Protection for Godzilla, King of the Monsters! You may recall from my Manos article that works published or registered after 1964 have an effective copyright date of 95 years from the date of publication or registration. This is primarily due to the automatic renewal provision of the copyright law. Works published from 1923-1963 require manual renewal registration to enjoy the same period of protection. In other words, the author or copyright holder must renew the copyright with the Copyright Office within 28 years of their first registration in order to receive the benefit of the renewal term of 67 years. Godzilla, King of the Monsters registered its copyright protection on April 27, 1956 according to the Catalog of Copyright Entries, Volume 10, 1956 at page 13. It was copyrighted by Jewell Enterprises, Inc. and is given the number LP6465 (LP = Published motion picture photoplays). The current Public Catalog from the Copyright Office gives a renewal notice for Godzilla, King of the Monsters, RE0000254883, dated December 31, 1984. While this is not within 28 calendar years of the original registration, the original protection term extends to the end of the 28th year from the initial year in which the protection first accrued. The renewal for Godzilla, King of the Monsters had to have occurred some time in 1984, which it did. Therefore, the copyright in Godzilla, King of the Monsters will expire in 2051 absent any further change to the copyright term by Congress. When you search for copyright registrations, post 1978 works are freely searchable through the Copyright Office's online search function. However, for works before 1978, you will have to search through the volumes of the Catalog of Copyright Entries. Each year usually has 12-14 volumes covering all kinds of works. Each volume can be accessed through the Internet Archive or downloaded as a PDF. The listings for motion picture works may be split into two volumes, one covering the first half of the year and the second covering the second half of the year. The copyright status of Godzilla, King of the Monsters! is the easy part. The protection afforded to the original Godzilla is not so easy to trace. First, Godzilla cannot owe its protection to Godzilla, King of the Monsters because the Japanese film is not a derivative work of the American film. The reverse is true. Second, the subtitled versions of Godzilla released in 2004 (Rialto) and 2012 (Criterion) are derivative works of the Japanese-language original film and have their own lengthy terms (95 years) of copyright protection attached to them. Interestingly, Godzilla is described as renewed in Registration Number RE0000145774 as of December 14, 1982. The original registration number given is PA0000157725 with a date of November 3, 1954, which is the film's original release date in Japan. However, if you look at PA0000157725, it also has a date of December 14, 1982 and notes that an English subtitled version was deposited in lieu of the original by special permission. As I mentioned above, a subtitled version of Godzilla was hitting the art house circuit during this time. You will see a similar entry for Seven Samurai, originally released in 1954 and renewed in 1982. Godzilla Raids Again has a similar history, with renewal in 1983 (RE0000179539, RE0000188890) relating back to an original publication date of 1955 (PA0000172648). The Gigantis the Fire Monster version also has a true 1960 registration, LP16500, and a 1987 renewal, RE0000350420. The PA prefix stands for performing arts and is a collection of many different types of works which previously had their own prefix like LP and DU. The PA prefix did not exist in 1954 or any year near it. Godzilla was not registered in the Copyright office, nor were other Japanese films from Toho studios during this time. Typically Japanese films were registered when they were in the hands of a U.S. distributor and were either dubbed or subtitled. So, how did Toho and other foreign film companies protect its films from being pirated abroad from the 1950s onward? They relied upon international treaties similar to the Berne Convention. The U.S. did not become a signatory to Berne until 1988, prior to that other treaties encompassed copyright protection between the two companies. The US and Japan have had copyright relations since 1909 and there is an unbroken copyright protection continuity (with exceptions not material here) between the two countries despite World War II. Essentially, a work that followed certain basic copyright formalities in its own country received reciprocal protection from the United States. The most important requirement was a copyright notice on the work when it was first published. Registration could occur during any time during the initial period of protection. The film was renewed in 1982 and that seems to have secured its long-term protection in the U.S. As a work for hire, it will enter the public domain in 2049. How long is the copyright term for Godzilla in Japan? The answer is not quite as simple as you might expect. Japan currently has three periods of protection. First is life of the author(s) plus 50 years, second is 50 years of publication of works from a corporation or legal person and third is 70 years from date of publication 70 years applies to cinematographic works created or published on or after 2004. Works published or created before 2004 enjoy 50 years of protection, but from which point, publication or author's death? So, for Godzilla and every other Godzilla film until Godzilla vs. Hedorah (1971), who is the author? Godzilla films were usually more collaborative works than Kurosawa's films. The collaborative team for Godzilla included several people, principally Director and co-Script Writer Ishiro Honda, Producer Tomoyuki Tanaka (who came up with the original idea), Special Effects Director Eiji Tsuburaya and Music Composer Akira Ifukube. Most of these men would comprise the team for the later entries in the Godzilla franchise until 1975. If the Kurosawa Rule is strictly confined to the director, then it would be Honda's death in 1993 that would start the clock on the 38 years for Godzilla. If on the other hand, Japanese law on co-authorship is more like that of the United Kingdom's when it comes to film (last to die of Principal Director, Screenwriter, Dialogue Writer or Film Composer), then it would be measured from Ifukube's death in 2006. In the U.S., there used to be many, many copies of films believed to be in the public domain released by bargain basement companies on VHS and, to a lesser extent, on DVD. Godzilla vs. Megalon is one of those films, four US VHS covers from four different companies of the film can be found here : http://www.tohokingdom.com/articles/art_boxart_1970-1980.htm The public domain outfits would find films without a copyright notice on them and run with them to the end of a tape spool. When Cinema Shares released Godzilla vs. Megalon to theaters back in 1976, they apparently omitted this requirement. This means that the English Dubbed version is in the Public Domain in the United States. However, the situation does not end there because the English Dubbed version is a derivative work of the Japanese language original. The Japanese language original from 1973 had a copyright notice on its film prints, so it is protected by both the US and Japanese law. Copyright protection in a protected original work extends to a derivative work. The "translation" of Godzilla vs. Megalon from Japanese to English is certainly a derivative work. By contrast, parodies and other fair uses are not subject to the original copyright holder's control. Toho did not really attempt to enforce its rights until the DVD era for reasons unknown but likely because it would have simply have been too expensive to sue for too little gain. Sometime in the DVD era, Toho decided to drop the hammer on the public domain companies. In one famous instance, Rhino Entertainment originally released the MST3K Godzilla vs. Megalon episode in the Volume 10 boxset, but quickly recalled it and replaced the film with The Giant Gila Monster. You will not likely be seeing MST3K versions of Godzilla vs. Megalon or Godzilla vs. the Sea Monster released in the future by Shout Factory (which has rights to MST3K). Of course video recordings of these episodes are not hard to find. Interestingly, the Showa Gamera films (1966-1971) are still being hawked by Alpha Video, a public domain company, but it no longer advertises Godzilla vs. Megalon for sale. In the United States, a copyright notice had to be applied to a work when first published, otherwise it forever lost copyright protection. Forgetfulness often lead to the defeat of the important proprietary rights secured by Copyright. However, not all countries required a copyright notice or other formal requirements like registration or deposit of the work. These countries followed the Berne Convention, which essentially allowed copyright to attach to a work automatically when it was published. In order to establish some universally applicable scheme of copyright reciprocity between countries, the United States and other nations entered into the Universal Copyright Convention of 1952, the UCC Geneva. The UCC Geneva allows a work published in a country who is a party to the Convention the copyright protection afforded to domestic works in other countries. All that is required to meet the formalities requirement of the Convention is to affix a copyright notice to the work when first published. There is no need to deposit the work in a central depository or engage in other formalities. The Convention was in force in the United States as of September 16, 1955 and in Japan as of April 28, 1956. In the U.S. releases of the films Seven Samurai (Criterion Blu-ray), Godzilla (Classic Media DVD) and Godzilla Raids Again (Classic Media DVD), there is no contemporary copyright notice on these films. However, films like Rodan, The Mysterians, King Kong vs. Godzilla and later films all have a copyright notice and © at the end of the film. The notice gives the title of the film, identifies Toho Co. Ltd. as the copyright holder and gives the year in which the movie was published. The first set of films were first published in 1954 and 1955 while the films from Rodan forward were published in 1956 and later. Even though Japanese domestic law did not require a copyright notice, by placing the notice on their films Toho assured that they would be protected in other companies. Given the increasing market for Japanese fantasy and prestige films, this was a no-brainer decision to protect the value of these films. 1953, - "That since April 28, 1952, the conditions specified in sections 9 (b) and 1 (e) of title 17 of the United States Code have existed and have been fulfilled with respect to the nationals of Japan, [*6] and that nationals of Japan have since that date been entitled and will continue to be entitled for a period of 4 years from the first coming into force of the Treaty of Peace [April 28, 1952], to all the benefits of the said title 17 except those conferred by the provisions embodied in the second paragraph of section 9 (b) thereof regarding the extension of time for fulfilling copyright conditions and formalities. Provided, that the enjoyment by any work of the rights and benefits conferred by the said title 17 shall be conditioned upon compliance with the requirements and formalities prescribed with respect to such works by the copyright laws of the United States;" 5 UST 118, TIAS 2906. "That any person entitled thereto by this Act may secure copyright for his work by publication thereof with the notice of copyright required by this Act; and such notice shall be affixed to each copy thereof published or offered for sale in the United States by authority of the copyright proprietor, except in the case of books seeking ad interim protection under section twenty-one of this Act. " Judicial decisions construing the statutory text of Section 9 indicated that this language was ambiguous as to whether publication in a foreign country without a notice placed a work in the public domain in the United States. For an excellent discussion of the authorities on this subject, see Chapter 9, "Copyright Protection for Works of Foreign Origin" in "The Internationalization of Law and Legal Education" (2008). The decision in Heim v. Universal Pictures Co., 154 F. 2d 480 (2nd Cir. 1946) held that notice was not required when the publication first occurred in a foreign country, and after that decision, the Copyright Office began accepting submissions where that was the case. But Heim was only binding on the cases arising out of the United States Court of Appeals for the Second Circuit (New York, Connecticut and Vermont). In addition, until the authorized publication of the work in the United States, these films may have enjoyed the common law protection afforded to unpublished works. After UCC Geneva, copyright notice on first publication anywhere in the world was effectively required until the U.S. adopted Berne. Therefore, while Toho may have been safe in relying on the ambiguities of the pre-UCC Geneva law for its earlier titles, in 1956 it adopted to the new requirement by placing a Copyright Notice on all its films. The third film in the Godzilla series, King Kong vs. Godzilla, was released on August 11, 1962 in Japan and in a re-edited form, with Western actors and Western music, on June 26, 1963. This film is unique in the Godzilla series because the rights to the film never reverted back to Toho. RKO held the rights to the King Kong character at the time and Universal released the film to theaters and later to DVD and Blu-ray. Toho continued to release the Japanese language film in Japan and other Asian markets in theatrical re-releases and on Home Video. Universal registered its copyright in King Kong vs. Godzilla in 1963 and renewed it in 1991, so its version is fully protected. Unlike Godzilla and its sequel and other films like Seven Samurai, Toho was not able to market its version in the U.S. Although the Japanese version did have a proper copyright notice, Toho let 1990 go by without renewing the copyright to its King Kong vs. Godzilla. Technically, its version entered the public domain in the U.S. in 1991. It would not stay in the public domain, however. In 1994, the United States enacted the Uruguay Round Agreements Act (URAA), which came into force in 1996. One of the provisions of this act allowed films which had fallen into the public domain because the formalities had not been followed (like copyright notice or renewal) if the film was not in the public domain in the country of origin. This automatically restored Toho's copyright in King Kong vs. Godzilla, in addition to hundreds of other foreign films, as of January 1, 1996. Toho registered the restored the copyright in its version of King Kong vs. Godzilla in 2002, PA0001151212. This would protect its version of the film from bootleggers and pirates for the next 55 years. It also made the discussion regarding Seven Samurai and the first two Godzilla films in the previous section academic except as to enforcement. The URAA, including its arguably retroactive application in restoring works of foreign authors previously deemed to be within the U.S. public domain, was upheld in the Supreme Court's decision in Golan v. Holder, 565 U.S. __ (2012). The court noted important restrictions on the URAA's restoration powers. First, any work whose U.S. copyright term, as renewed, which had fully expired would not be restored. Works from 1922 and earlier that would still have some copyright protection in their country of origin were still in the U.S. public domain. Second, no recovery for infringement could be had for conduct occurring before the effective date of the URAA or for the first year following its enactment. Third, the copyright holder had to file a notice of intent to enforce with the Copyright Office before they could bring enforcement lawsuits against parties who had previously relied upon the public domain status of the work. However, the Court recognized that it was within Congress' authority to define the scope of the public domain and that there was precedent dating back to the first Copyright Act of 1790 that established protection for works previously freely usable by the public. It noted that Congress' efforts in the URAA were to bring the United States; copyright requirements into line with the international community, which generally eschewed formalities when establishing copyright protection as outlined in the Berne Convention. Corinth had previously been involved in litigation on the issue of the copyright status of Bicycle Thieves and in that 1985 case, Int’l Film Exch., Ltd. v. Corinth Films, Inc., 621 F. Supp. 631 (S.D.N.Y. 1985) also out of the same court, the Court held that the film was in the public domain because the owners had failed to renew the copyright to the film. It also recognized that renewal certificates from the Copyright Office, one of which existed from 1976, were not the end of the issue. The renewal certificate for The Bicycle Thief was invalid because it was not issued on behalf of the author or an assignee but a licensee. Thus there was no valid copyright renewal. The Court did note, however, that dubbed or subtitled versions of the film may still be able to claim copyright protection as derivative works. Having been involved in the earlier case, Netflix could argue that collateral estoppel prohibited Corinth from re-litigating the film's public domain status. But this is 2015, not 1995, so Corinth should have argued that the original Italian language version is no longer within the public domain thanks to URAA. Italy, the film's country of origin, gives a copyright term of life of the author plus 70 years and De Sica died in 1974. His film is protected by Italian copyright law until 2044, making it eligible for URAA restoration. Control over the ur-work would give it total control over the film even if Netflix or its licensor decided to pay someone a few thousand to translate the film and provide new subtitles. However Corinth did not and the parties settled the case this month. Corinth a missed an opportunity to assert its restored rights under URAA. 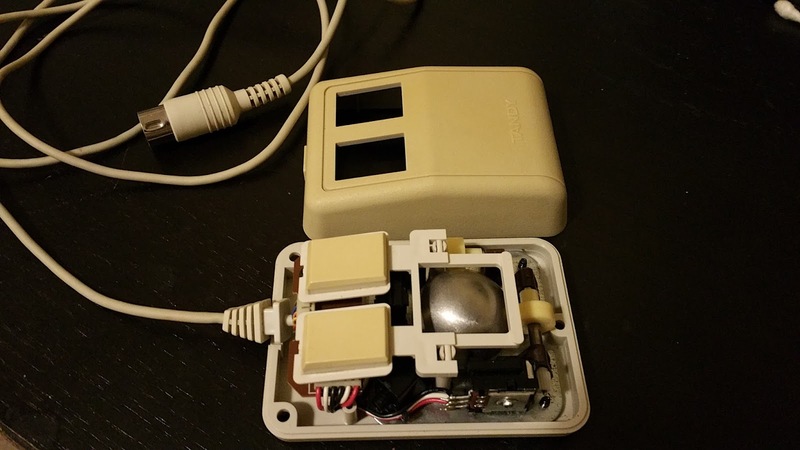 Tandy Color Computer Mice - A Viable Alternative for Tandy 1000s without a Serial Port? When Tandy designed its 1000, it helped reduce R&D costs by taking certain portions of the design from other of its computers. The 1000's keyboard is more-or-less identical to the Tandy 2000's keyboard. The Tandy 1000's joystick interface and connector was previously used in the Tandy Color Computer. While neither the Tandy 2000 nor the Color Computer are IBM PC-compatible computers, these interfaces were sufficiently similar to the PC keyboard and joystick interface to work with most PC software. 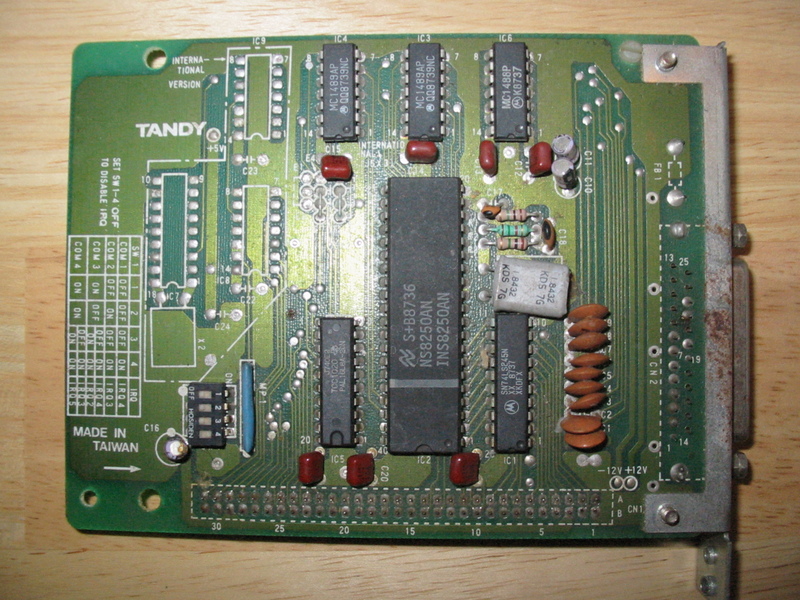 The first several Tandy 1000 models, the 1000, 1000A, 1000HD, 1000SX, 1000EX and 1000HX did not come with a built-in serial adapter. PS/2 ports would come much later to the Tandys. The 1000SX had five expansion slots, so adding a serial adapter is easy for that machine. The 1000/A/HD can also accept a standard serial adapter, but they only have three slots and need at least one of them for memory expansion. 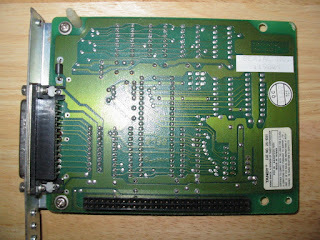 The final expansion board had room for a PLUS card to add as a daughterboard, and Tandy sold a serial adapter PLUS card. This PLUS card the only way you were supposed to add a serial adapter to the Tandy 1000EX or 1000HX. The EX and HX are the most difficult machines to upgrade because they use the odd PLUS form-factor and BERG-style connectors instead of edge connectors. 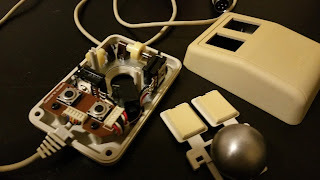 The Tandy TRS-80 Deluxe Joystick, Tandy Part No. 26-3012 was marketed for both the Tandy 1000 and Tandy Color Computer lines. It used a black and off-white color scheme with a red and a black button. The black button does not work in the Color Computer 1 or 2. It is self centering, but there are a pair of latches on the bottom that you can use to allow for free-form movement of each axis. It has a pair of trimmer controls to assist in obtaining a proper center for the joystick. Tandy also marketed a pair of cheaper, one-button joysticks, Tandy Part No. 26-3008, that are non-self centering for the Color Computer, but you can still use them for the 1000 line. Of course, considering how cheap they are, you would have to be truly desperate to put up with them. These joysticks have a black base, silver or black handle and red button and were sold as a pair. They do not have any type of trimmers, making them even worse for trying to center a joystick. Nonetheless, they do technically work in a Tandy 1000. Tandy also marketed a pair of mice for both computers. 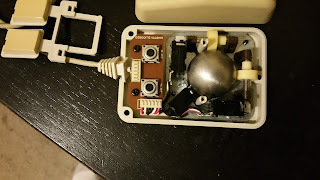 The Tandy TRS-80 Color Mouse, Tandy Part No. 26-3025, had one button and used a black/red scheme, just like the cheap joystick pair. 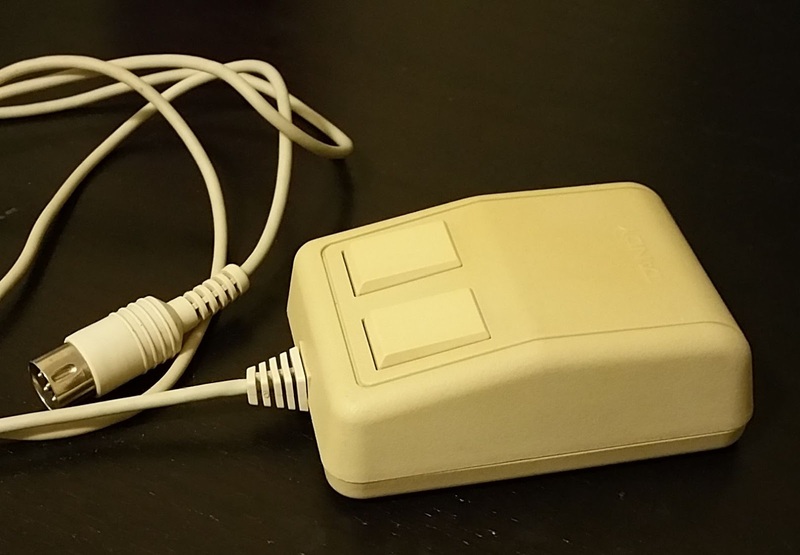 The Deluxe Mouse, Tandy Part No. 26-3125 came later but had two buttons and used an off-white color. Both use the joystick connector, and unlike the joysticks both mice were advertised for the 1000 line. 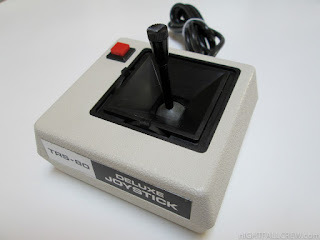 You could also get Touch Pad that plugged into the joystick port. 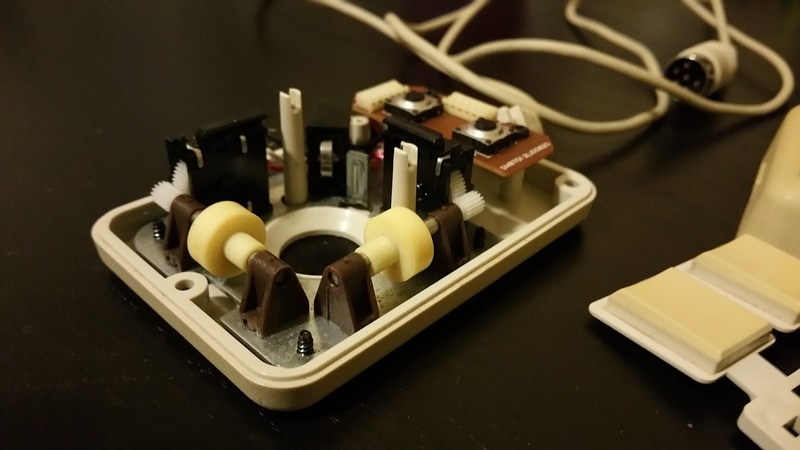 Internally, the Tandy Mice does not use rotary optical encoders like every other ball mouse ever made. 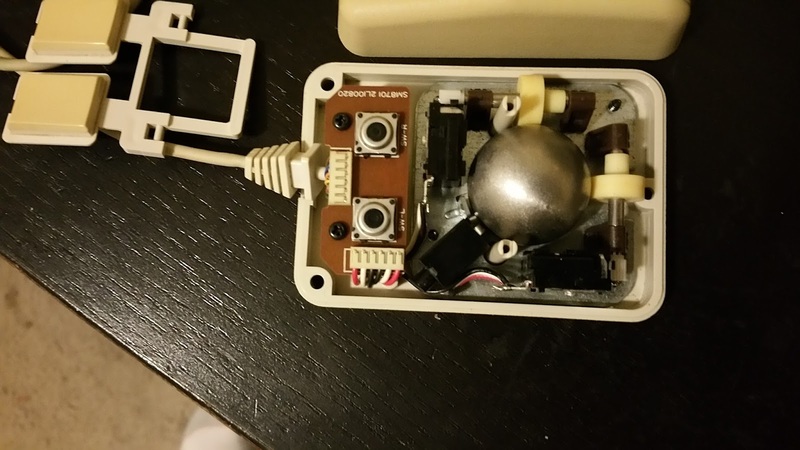 Instead the ball moves a pair of potentiometers, just like the Tandy and IBM PC joysticks! There is no microcontroller inside to encode anything as there would be with a serial or PS/2 mouse. The Tandy mice are read and function just like a joystick, the only difference being the way you manipulate the potentiometers. They have no trimmers and are difficult to calibrate because it is not obvious where the mouse "ends". Many DOS games support a mouse cursor, and a couple will work reasonably well on a 4.77MHz or 7.16MHz Tandy system. The early LucasArts SCUMM games starting with Maniac Mansion and the MacVenture ports like Shadowgate have a cursor which can be controlled with a joystick or a mouse. Wasteland and Dragon Wars also support a cursor, but those games (ported from the Apple II) can be played best by mastering the keyboard commands. 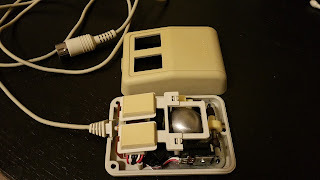 Tandy also released the Digi-Mouse, a bus-style mouse that does not work in a serial or PS/2 port. Its expansion card comes in standard pin connector and PLUS-style form factors. Both adapters have a real time clock chip on them but are hard to find. Obviously, both the mouse and clock chip require special drivers, which can also be found at Tvdog's site. The driver has a Microsoft copyright as viewed in a hex editor. The Digi-Mouse connector uses a 9-pin connector and can support three buttons and two pairs of quadrature signals, just like a Microsoft Inport mouse. I would not be surprised if Microsoft's Inport mice could also work with the driver and expansion card, although the signals may require rewiring. The card uses IRQ3. Eventually Tandy would release its own serial mice and PS/2 mice. The Tandy 1000 TX is the first Tandy 1000 to come with a built-in serial adapter, and the later 1000s always had one. The TL/3, RL, RLX and RSX also support PS/2 mice, but you will have to manually set the IRQ in the mouse driver (except for the RSX) because these systems lack IRQs 8-15 and the PS/2 mouse IRQ is assigned to 2. They assign the IRQ to 3. Additionally, Personal Deskmate, which came with the Tandy 1000 EX, comes with the JOY.SYS driver. In fact, with Personal Deskmate, the cursor will be corrupted with any mouse driver except the JOY.SYS driver or the Digi-Mouse driver (see below). Personal Deskmate 2 and later GUI versions are not picky about the mouse driver loaded. Unfortunately, the JOY.SYS driver does not like the PCT 286 Express Accelerator Card and will refuse to allow the PCT software to run if the JOY.SYS driver is installed. The Tandy Deluxe Mouse still shows a jittery cursor with the JOY.SYS driver and many programs. Low resolution graphics and text modes will not show as much jitter as medium and high resolution graphics modes. Moveover, some games like the high resolution version of Maniac Mansion, do not like the driver and will show some erratic cursor movement. If you are going to experience jitter, then you may as well use a joystick instead of a mouse. 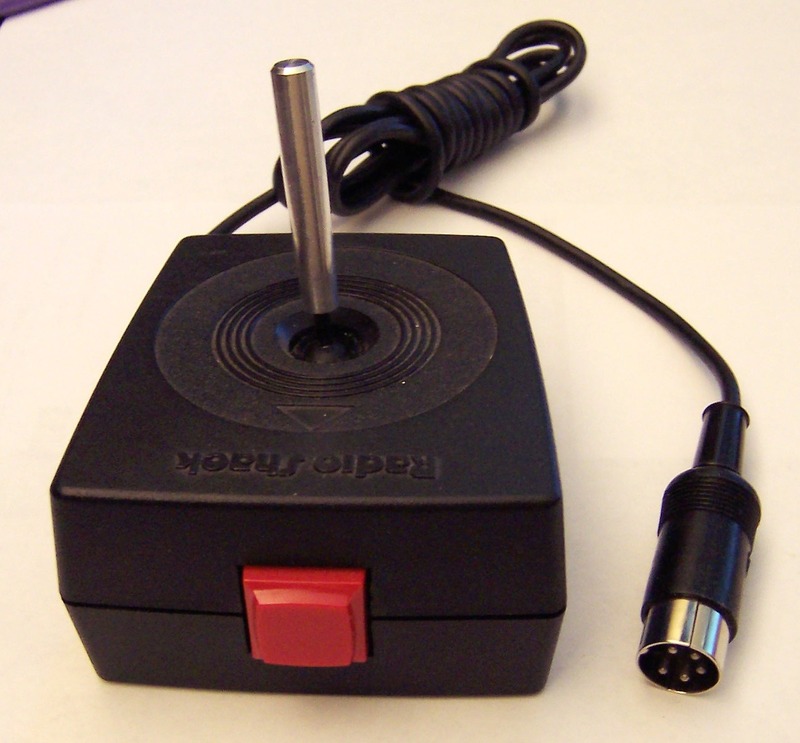 Ultimately, if you have a joystick with the free-form switches, I cannot recommend using these mice on a Tandy 1000. Over the past decade (and a bit) people have been writing new software for "oldskool" PC systems like the IBM PC, IBM PCjr. and the Tandy 1000 computers. Some of these programs have been really impressive or have pushed these systems in ways never envisioned by their creators. While other systems like the Apple II, Commodore and Atari computers may have had comparatively more software released during the same time period, the early PC world has not lain dormant. Starting by the year of announcement, I will identify each project I have found particularly worthwhile or noteworthy and explain why they deserve to be here. I hope this blog entry will serve as a Thank You for all the programmers who put their effort into making new software for the oldest PCs. In 2004, Trixter, the creator of The Oldskool PC website and the co-founder of MobyGames, discovered a way to play full motion video on an IBM PC with a CGA card. He did not have much to work with, an 8088 CPU running at 4.77MHz, 640KB of RAM, and a CGA card that could display 16 colors maximum, and all those colors on the screen only in text mode. Moreover, in 80-column text mode, many CGA cards would show "snow", random mosquito noise, when refreshed too quickly. Trixter looked to the 40 column (by 25 rows) mode for his implementation of full motion video. That mode supports 16 colors, 256 distinct but unchangeable character glyphs, and 8x8 character cell sizes. Most importantly, each 8x8 character cell can choose from any two of the 16 colors for foreground and background colors. A single screenshot using text characters this large would often not show recognizeable objects, but at 30 frames per second, video can be much more watcheable. The 40 column mode has the benefit of only requiring 2,000 bytes to fill the screen compared to 4,000 bytes for an 80-column mode screen or 16,000 bytes for any of the CGA graphics modes. Of course, the illusion of video is often helped by the use of audio. Use of the PC Speaker was out because too much time would be spent decompressing and displaying the graphics. So Trixter targeted the only devices that would work in a PC's 8-bit slot, could output digital audio and were sufficiently common, the Sound Blaster. 8088 Corruption required a Sound Blaster that supported the auto-init DMA commands so the card could keep its digital audio buffer fed with minimal CPU involvement. The final piece of the puzzle is having a hard drive, preferably a fast one, to hold the video file to be played. The concept of a tracker was not a new one in 2008. Music tracker programs had first appeared on the Commodore Amiga in 1987 with Ultimate Soundtracker, which have a graphical interface to music programmers so they could assign PCM samples to their music in a programming-friendly format. 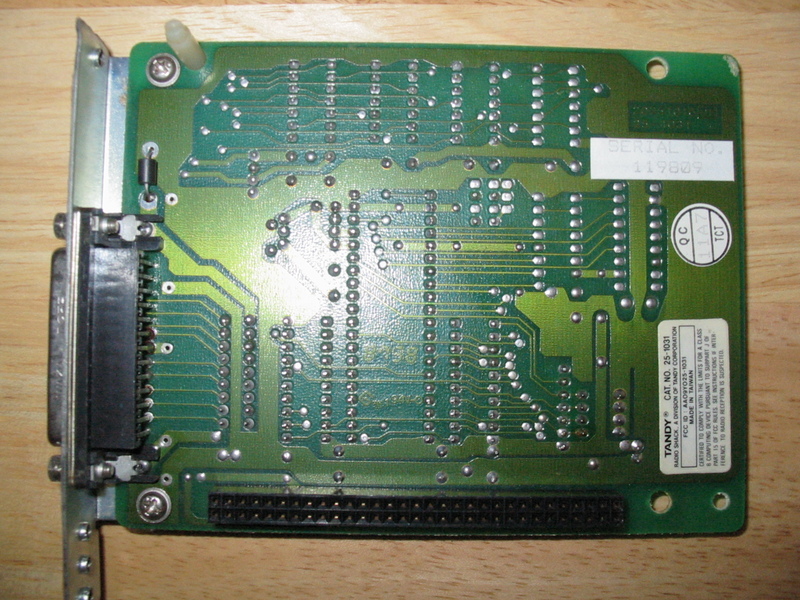 The Gravis Ultrasound card was a popular target of early DOS-based tracker programs. 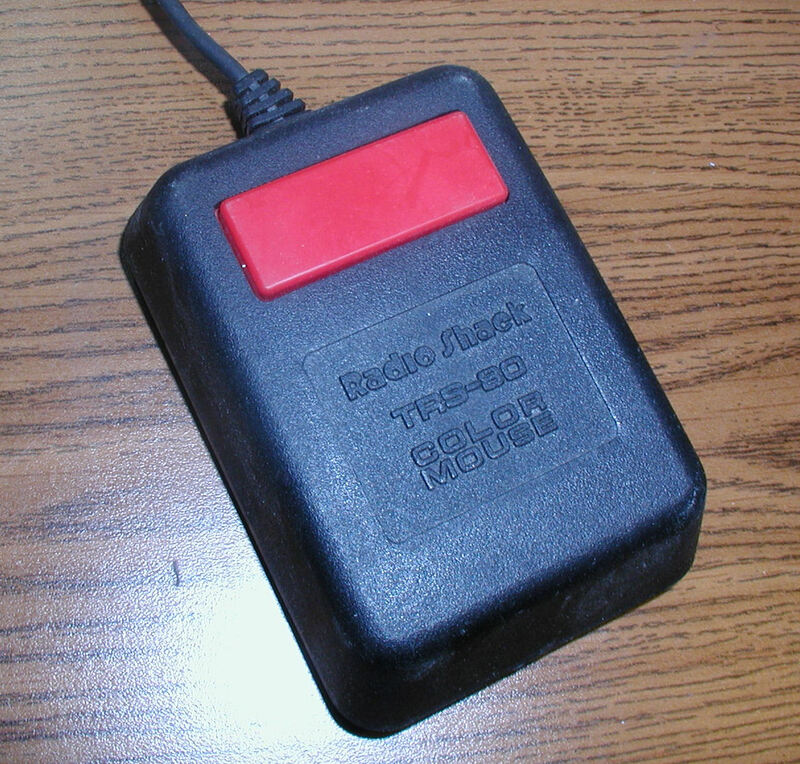 Eventually tracker programs were released for the Adlib OPL2 and OPL3 chips as well as other popular platforms that used chiptune music like the NES, the Sega Genesis and the Game Boy. Trixter noted that there was no tracker program that worked with the PC Speaker, so he sought to change that. The PC Speaker is musically a very limited device, essentially a 1 channel square wave with no volume control but a 16-bit frequency divider. While it could produce digitized and multiple voices by toggling the speaker cone on and off faster than it was designed, there were several disadvantages to this. First, the resulting volume is often very low. Second, these techniques require a large amount of CPU time, leaving little time for much else on 8088 and 80286 machines. Third, the audio can sound very "buzzy" and have a high noise floor, leaving the listener with an uncomfortable experience. Was there any other way to allow the PC Speaker to sing in more than beeps and boops? You like the Internets, right? I do too, but those people still stuck with DOS can have a hard time getting online and enjoying it. Enter mTCP, a suite of utilities developed by VCF forum member mbrutman in 2008. At first he released the utilities separately, starting with IRCjr. IRCjr. is a very slimmed down IRC client that can be run on any PC and intended for the IBM PCjr. Since mbrutman is a IBM PCjr. fan and runs the only IBM PCjr. fansite on the web, it would be natural for him to ensure that the client is sufficiently light-weight to work on a PCjr. or a PC. He also released other programs like a DOS Telnet program and soon began to bundle a whole package of 8088-friendly Internet utilities called mTCP. mTCP has been continuously updated since 2008. Using the utilities in the package make it very easy to get online with an Ethernet card and a packet driver. 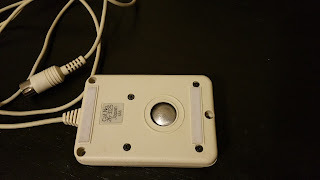 For the earlier systems, a Xircom PE3 parallel port Ethernet adapter can work with anything with a standard parallel port (except for the Tandy parallel port). 8-bit Ethernet cards usually work just fine with a transceiver, and 16-bit cards often have RJ-45 jacks so you can directly plug them into a router. Some of these cards are hybrid cards that can work in an 8-bit or 16-bit slot. Wireless Ethernet adapters can be made to work with older systems. If you can find a DOS packet driver for the card, and most major brands and chipsets have one, you are all set to play with mTCP. My favorite programs are FTP and FTPSRV. FTP is an FTP client, and you can use it to obtain files from an FTP Server. This of course includes your own FTP server, making for easy file and directory transfers to and from your old computer to your new computer across the network. However, being a lazy guy, I prefer to use FTPSRV on my vintage computer. This allows me to obtain full access to my old computer from my new computer. I can use the FTP client on the new computer to move, copy, delete files on the old computer's storage devices, and I can send files to them or take files from them. It sure beats sneakernet. A new game that can run on the IBM PC? Who would want to write a new game for that ancient thing? Enter VCF forum member deathshadow, a man determined. 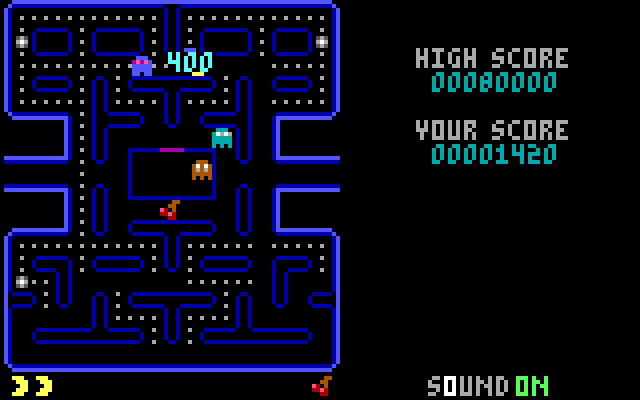 He was determined to write a Pac-Man clone that played fast with an IBM PC without the 4-color limitations of the official Pac-Man from Atarisoft or PC-Man and other unofficial clones. Deathshadow decided to use the CGA 160x100 "graphics" mode. This gave him freedom to use the whole 16-color palette on any display at the expense of resolution. He decided to keep the aspect ratio of the maze to be true to the original arcade game and to have the maze use the proper orientation. He used red, cyan, magenta and brown for the ghosts, yellow for Pac-Man and appropriate blues for the mazes and colors for the fruit. He included all eight types of fruit, both warps and the exact number of dots found on the original arcade. It saves the high scores and can fit onto a floppy disk. He did not include the intermissions that the original game had, and I doubt there is a split screen level 256. Deathshadow cast a wider range of hardware support, his game can support CGA, PCjr., Tandy, EGA, MCGA and VGA graphics adapters. He quickly added joystick and high score saving support. He added support for the PC Speaker, Tandy 3-voice sound, Adlib and even CMS/Game Blaster for music and sound effects. Later he added MT-32 and General MIDI support. It runs at full speed on an IBM PC with 128KB, even with the joystick reading, although you will have to put up with a bit of snow with many CGA cards. The game even runs on an unexpanded 128KB PCjr. Now there is a feat! 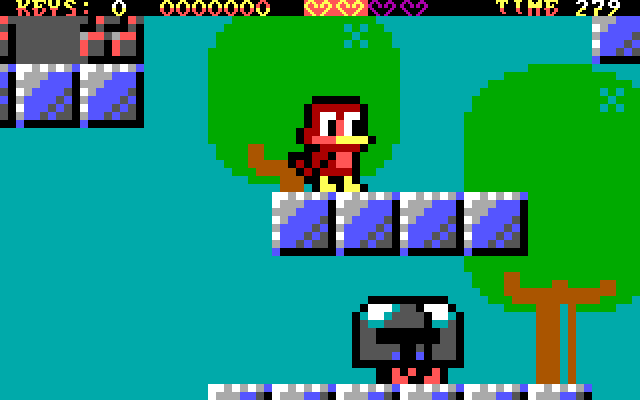 He later ported the game to the Commodore 64, which utilizes a 160x200 resolution, smoother graphics and 3-voice music. Tandy's can only display 16 colors on a screen at once, right? A VCF forum member called chjmartin2 challenged that idea. While it technically can only display 16 colors in a 320x200 mode, or in a 640x200 mode for the Tandy TL, SL and later machines, color blending has often been used to try to give the appearance of more color. Most RGB monitors, even the crappy Tandy CM-5, make most dithering techniques look very obvious. What chjmartin2 did differently was instead of trying to put two colors next to each other to try to simulate a third color, he displayed two colors in a rapid cycle and relied on the viewer's persistence of vision to make a third color. By displaying two images 30 times per second, he could obtain a result that, while looking somewhat flickery, could give the impression of greater than 16 colors. He made a tool that can take 24-bit BMPs and split them into two images which his program would then display 30 times per second, each following the other. So finally we have a first for the Tandy, the ability to display lifelike images with sufficient color. Because each combination of two colors does not give a unique third color, 85 colors can be obtained. His program relied on the GW-BASIC included with Tandy DOS, demonstrating that you do not need to master Turbo Pascal or Microsoft Assembler to produce something cool with an old machine! He released his program in 2013 and also included a converter that runs in Windows and will convert any 320x200 24-bit BMP image into a pair of files his program can display on a Tandy 1000. It works on my Tandy 1000 SX and he wrote the program on a Tandy 1000 TL, so it should work with any Tandy 1000 with a built-in Tandy Graphics Adapter. I do not believe it would run in a PCjr. without modification because of the reliance on Tandy GW-BASIC. This year brought us the first demos for the IBM PCjr. from Hornet. Hornet is the demo "group" of Trixter and Phoenix. They not only ran it on a PCjr., premiering it at @party 2013, but also coded the demo on the machine. Given the chicklet and rubber dome keyboard that the PCjr. uses, that must have been fun. Trixter wanted a "world first" and in these programs he obtained it. While the demo will work in a Tandy 1000, it will show a row of black lines after each row of graphic lines. This is because the Tandy cannot double the scanlines as a PCjr would. Nor does DOSBox properly emulate this functionality of the PCjr. Late in 2015, VOGONS forum member NewRisingSun discovered how any Tandy, except for the original 1000/A/HD, could double the scanlines via another method and released a fixed version of INTROjr that displays properly on the Tandys. Trixter believed that 8088 Corruption was the limit of the IBM PC and CGA's graphics capabilities. But then he discovered the potential of CGA's high resolution composite color mode. But the old problems surfaced. How do you run video at 24fps when you have to output 8x the graphics data on a system so slow as the 8088-based IBM PC? Moreover, when hard disk interfaces of the time only pushed 90KB/sec, how can you get so much data to the graphics card? Trixter discovered he could do it if refined his techniques. When he had finished dancing naked in the streets, he wrote a new video player that made 8088 Corruption obsolete. Instead of always transferring 2KB per frame as he did with 8088 Corruption, he would only transfer as much pixel data as his demo needed, up to 2KB. He would only update those portions of the frame that needed updating. His encoder would do all the hard work on a modern system and leave the video file simply to tell the 8088 which pixels to update and when. Moreover, instead of just pointing to data and telling the 8088 to fill the graphics memory, he converted that data into code, allowing much faster execution. Trixter also released a player that allows people to play back video files as his demo did. He documented the video/animation system as XDC, (X86 Delta Compiler) People can make their own videos, although the process is not as easy as running a video file through a converter. The XDC format supports graphics in 160x200 resolution (Tandy/PCjr only) or 160x100 resolution at 16 colors or 640x200 resolution in two colors (you can specify B&W or color in the encoder). The video must be broken down into individual frames in the bmp format which are accompanied by a 8-bit PCM wav file up to 44.1kHz. Then you use a script file to run it through an encoder in DOS, which makes the XDV file which you can play. 2015 began slightly inauspiciously for oldskool PC demos. 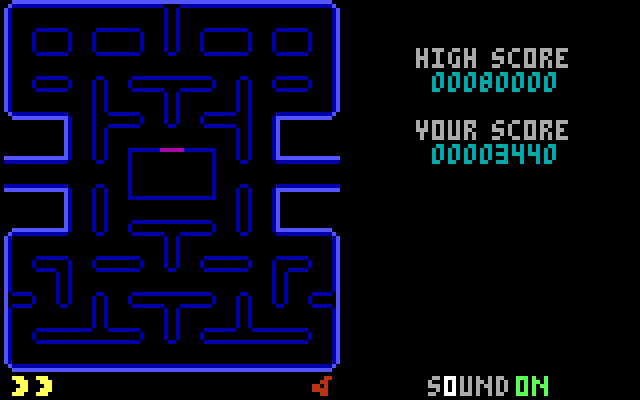 GP-01 was a demo that relied on CGA. Unfortunately the demo did not work on real hardware, it was coded in DOSBox and ran only on DOSBox, making it a DOSBox specific demo. As CGA may be improved to more closely emulate real hardware, eventually this demo may fail to run on DOSBox. A VOGONS/VCF forum user named Scali eventually fixed the demo to run on a real IBM PC with CGA. The demo version of 8088MPH was extremely picky about the hardware it would run on. If you did not have an IBM PC, XT, Portable or true clone, you could forget about running all parts of the demo correctly. Moreover, the demo was designed for an "old-style" IBM CGA card's composite colors. "New-style" IBM CGA's colors were a bit off. Finally, the CRT controller on the CGA card had to be a Motorola 6845 and many CGA cards came with a Hitachi 6845. The demo took advantage of a text-mode feature found on Motorola chip that was not duplicated on the Hitachi chip. There were several firsts for this demo. The most visibly spectacular was the demo's ability to display 1,024 colors using 80-column text mode and color composite graphics. Using color composite graphics with a text mode is usually undesirable, the monitor does not have sufficient bandwidth to keep up with all those color changes, usually making for a blurry mess of text. However, by using certain carefully selected ASCII values, like the U, the !! and the ▓, cutting down the cell size to 8x2 and using different foreground and background color combinations, a vastly greater color palette is possible. Another first for the demo was implementing a MOD player for the PC Speaker. While the main two music pieces use songs adapted for Monotone, the final music played during the credits would have taken too much time away from the visual effect earlier in the demo. The Amiga MOD format supports 4-channel playback. Playing MODs using the PC Speaker is nothing new, but playing them at an acceptable sample rate with a 4.77MHz 8088 is a lot more difficult. With some amazing 8088 trickery, they were able to obtain an effective 16.6KHz sample rate from the PC speaker through Pulse Width Modulation..
Because of all these code optimizations and cycle timing, the number of machines on which this demo is guaranteed to run correctly still amount to three, the IBM PC, the IBM PC/XT and the IBM PC Portable (which is really just an XT in a "portable" case). Even the Tandy 1000SX running at 4.77MHz runs a bit too fast for the Kefrens bars, that portion of the demo will lose sync. DOSBox will not run that and several other portions of the demo, you may be able to skip them if it does not crash the emulator. A recent fork of PCem called PCem-X can almost complete the demo, but the Kefrens Bars does not look right and the demo crashes as it tries to play the MOD at the end. 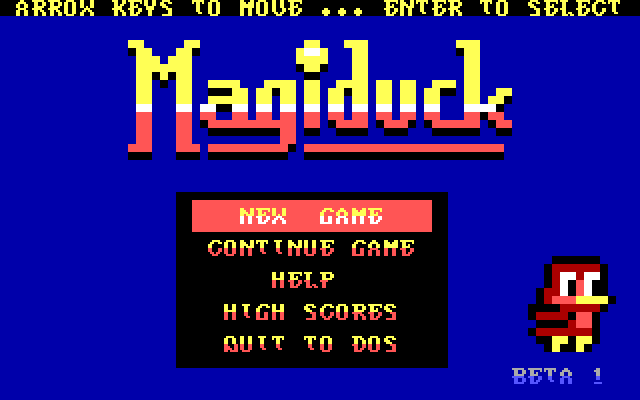 Although not finished, another program of note is a game called MagiDuck. 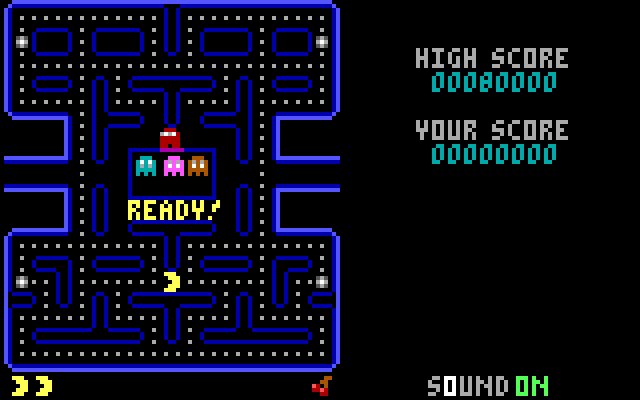 This game, like Paku Paku, is designed to run on an IBM PC with CGA and 256KB. The author, VCF forum member mangis, is learning as he goes. Judging by the beta released in December of 2015, he has learned his craft very well. MagiDuck is a sidescroller with a vertical orientation with a simple control scheme of three directionals and two buttons, one for shooting fireballs and one for jumping. Your character, the duck, can jump and float downwards and move left and right and look down. She can jump on some enemies and collect keys and treasures to score points. She has four hearts which function as a health meter. There are passages that open touching switches and levels that only open by finding secret stars. There are eight kinds of enemies and six different types of special blocks. There are three save slots and the game tracks your completion level. The game feels reminiscent of Kirby's Adventure for the NES in this regard. This game has the feel of a shareware game from the early 90s. There are only PC Speaker sound effects, no sound card support has been implemented. Neither Commander Keen 1-3 nor Duke Nukem/Nukum had sound card support either and both are very fun to play. So is this game, which has 10 levels, 3 secret levels and a boss level. 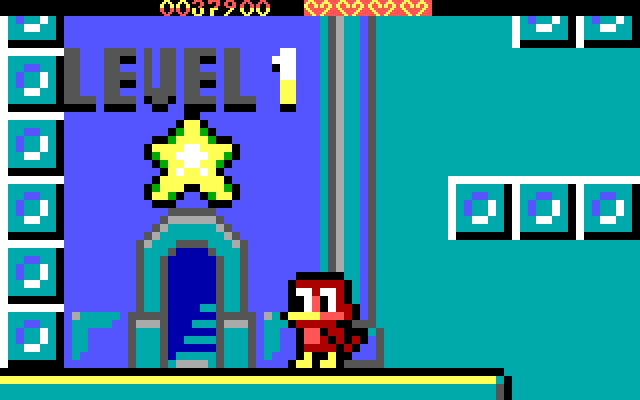 You can complete any of the levels in any order and the game saves high scores to disk. The large characters make up much of the challenge because you do not necessarily know what may be in front of you or above you, so you have to be careful. What makes this game particularly well-suited for the IBM PC is the graphics. MagiDuck can show all 16 colors on the screen at a time. It does this by tweaking the CGA 40 column by 25 row mode to show 50 rows and then uses the half-filled character to give two distinct "pixels". The foreground and background attributes allow each half of the "pixel" to show a different color. 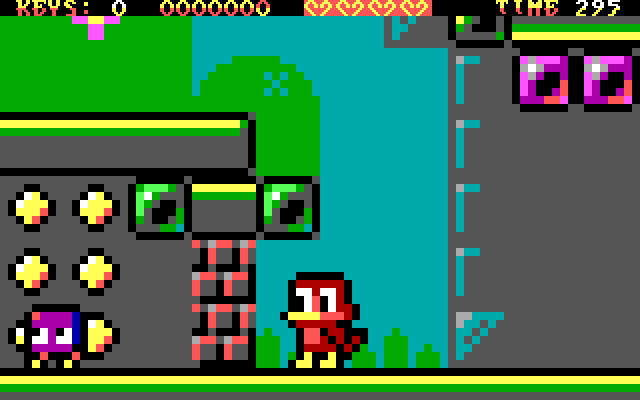 The effective resolution is only 80x50 pixels, half the semi-official CGA 160x100 mode. What MagiDuck loses in terms of resolution, it gains in that there is no CGA snow to deal with and maintains a smooth framerate. The game does detect EGA and VGA cards, so it should work in any PC compatible that can run DOS (with the possible exception of the PCjr.) and supports at least a floppy disk. Hopefully the final version 1.0 will work with a joystick, because these games lend themselves well to Gravis Gamepads. The Blu-ray format has shown some favoritism toward the Godzilla series. Unfortunately, except for the Japanese Blu-rays, the series is not complete. Here I will detail what is available and what English-speaking audiences can appreciate (without having to look elsewhere to read a translation of Japanese dialog). As described in a previous blog entry, http://nerdlypleasures.blogspot.com/2013/01/godzilla-on-disc-criterion-blu-ray-vs.html, Godzilla has two official Blu-ray releases, and the Criterion is vastly superior in terms of image and audio quality, but in the special features department the two are a bit more even (or would be if Classic Media included the U.S. version on the Blu-ray, but it is only available on DVD.) I would suggest obtaining the Criterion Blu-ray and the Classic Media DVD for the special features. Germany has official Blu-ray releases of two Godzilla films which are not available in the U.S., Godzilla Raids Again and Ghidorah the Three Headed Monster, but they have no English language options either in dubbing or subtitles. Toho released many of the Godzilla films in 2009 but re-released them and added the rest of the Godzilla films in 2014 for the U.S. Godzilla film's release. The 2014 re-releases retail for 4,700 Yen, which is more reasonable than the DVDs used to cost (Toho reissued those as well for 2,500 Yen). France also has its official version of the original Godzilla and Godzilla Raids Again. I cannot find any other official Blu-ray releases for the Godzilla films, and the Spanish Blu-rays appear to be pirated. All the Gamera films, the three Daimajin films and the three Heisei Mothra films have official U.S. releases (the 3rd Mothra film was not released on DVD). You can also buy the Gamera films in a box set containing the three Heisei films and two "volumes" containing the first four and the last four Gamera films. While the films were released separately earlier on DVD, I do not believe Gamera: Super Monster was available. The first two Gamera Heisei films were originally released before the third film. The third film, whether sold individually or in a box set, holds the special features for all three films (behind the scenes, special effects, trailers). The presentation of the original Showa Gamera films leave much to be desired, being encoded in 1080i and having to fit four films on a Blu-ray disc. They contain no extras. Mill Creek released both the Gamera Showa and Heisei films and Daimanjin films, (originally released by Daiei) but the Daimanjin films have Behind the Scenes and Trailers for each film. The Mothra films come in a two-disc set and each film contains trailers. Godzilla from Criterion contains both the Japanese original and the U.S. version Godzilla, King of the Monsters. The Classic Media Blu-ray only has the Japanese original. 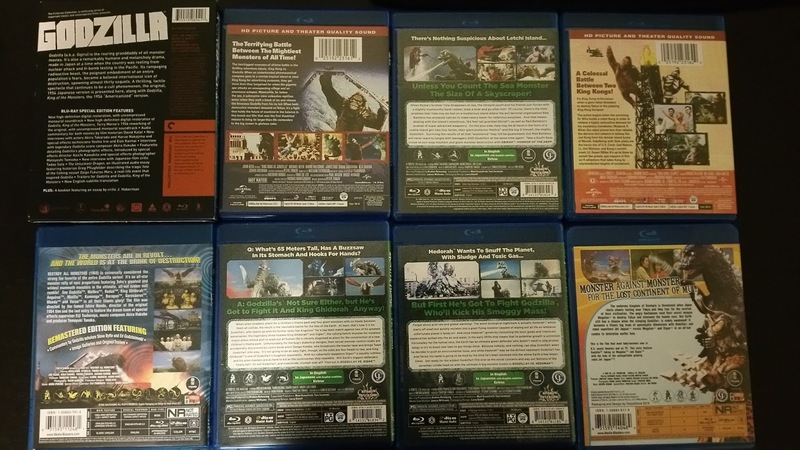 King Kong vs. Godzilla and King Kong Escapes only contain the U.S. Theatrical releases, which are dubbed and for King Kong vs. Godzilla heavily altered with U.S. actors thrown in. All the rest of the Showa films use the "International Versions", which are essentially uncut from their Japanese originals. They replace the Japanese language credits with English language credits and use dubbing typically from Japan (by Frontier Enterprises for Godzilla vs. the Sea Monster and Destroy All Monsters) or Hong Kong (for Godzilla vs. the Smog Monster, Godzilla on Monster Island and Godzilla vs. Megalon). The title card for Godzilla vs. the Sea Monster / Ebirah, Horror of the Deep uses a newer title that says "Godzilla vs. the Sea Monster", not the official title, which is "Ebirah, Horror of the Deep". All subsequent Toho films use essentially unremarkable International versions with the exception of Godzilla 2000. All have Japanese and English language soundtracks now. The Return of Godzilla does not include Godzilla 1985 with Raymond Burr. The good news is that Godzilla vs. King Ghidorah / Godzilla and Mothra: The Battle for Earth now come with English and Japanese language options and are not Pan and Scan. Sony's DVD had both these failings. Even so, they cut the credits at the end and shift the credits around at the beginning. I am not sure whether Daiei even put out "International Versions" of their films, but the films available are pure Japanese versions with English subtitles. Most of the Showa Daiei films were originally dubbed in the 1960s by AIP, but five films were later redubbed by Sandy Frank for home video. Godzilla 2000's Blu-ray features both the Japanese and English language versions of the film. The DVD only had the English language version. The Japanese language version is eight minutes longer than the English language version, but in most people's opinions nothing essential was cut or added when Sony did its English language version. The English language version looks clearly superior to the Japanese version. The Godzilla series are not known for an abundance of special features on U.S. discs. The films from Kraken releasing have trailers, but Universal's releases have nothing. There are two Blu-ray releases of Destroy All Monsters, both from Media Blasters. The first release in 2011 had quite a few special features, an Image Gallery, Production Art and Storyboards, a Promo Reel, 8mm Films and a Commentary from Steve Ryfle and Ed Godziszewski. The second release has none. The first release was discontinued shortly after it was released due to a dispute over the special features between Toho and Media Blasters. The first release can command $70-80 dollars used. The second release from 2014 has also just been recently discontinued. Godzilla vs. Megalon may also be discontinued. Godzilla vs. Megalon on Blu-ray has no special features, nor does the officially released DVD thanks to disputes between Toho and Media Blasters. However, there were some meaty special features prepared for it and some DVDs were released with the features included. Unfortunately, it is difficult to impossible to tell which is the featured disc and which is the featureless disc without opening the case. The special features included US and Japanese Theatrical Trailers, US Print and English Print Credits, and Image Gallery, Trailer Reel, Japanese trailer for Destroy All Monsters, an interview with Voice Dubber Ted Thomas and Commentary by Steve Ryfle and Stuart Gailbraith IV. These have been recently been released and are easy enough to find, however questionable some of the material may be legally. Godzilla vs. Biollante contains a lengthy Making of and a short Design featurette, both subtitled in Japanese. The Sony releases contain teaser and theatrical trailers for each film but nothing else except for Godzilla 2000 and the Godzilla Tokyo S.O.S./Godzilla: Final Wars release. For Godzilla 2000, there is a Japanese theatrical trailer, a short Behind the Scenes featurette and an Audio Commentary on the English Language version by the producers of the English language version of the film. In addition to the standard teasers and trailers, both films contain a Making of feature subtitled in Japanese. Godzilla Tokyo S.O.S. and Godzilla: Final Wars each have a behind the scenes featurette in addition to their trailers. DOSBox is an excellent program for taking screenshots of DOS games, it saves them losslessly in the Portable Network Graphics format. But what if you want to view these screenshots on real hardware, especially low-end hardware? Suppose there is a particular screen you really want to see on older hardware, can it be done? The answer is surprisingly yes, for the most part, and it's pretty easy. Once upon a time, there existed a picture viewer program for DOS called CompuShow. The last numbered version released is 9.0.4, and can be downloaded here : http://www.cshowplace.com/cshow.htm CompuShow can load most of the major image formats from the mid-1990s, including PNG, GIF, PCX, BMP and JPG and many others that are rarely encountered today. It can also convert picture files to these formats and more. CompuShow has the benefit of working on any PC compatible, from an IBM PC with an 8088 CPU to a Generic Windows 98SE machine. The program can fit on a 360KB floppy with room for some images, so it is small. Loading speed is decent even on the IBM PC. For a program of the later 80s to mid 90s, it supports a wide variety of graphics adapters. I have personally tested the program with an IBM PC with IBM CGA and Hercules Graphics Cards and the modes work as they should. I have also tested the program with my Tandy 1000 SX and Tandy 1000 TL and it works well with them. Finally I have tested the program with my 486 PC with a Cirrus Logic VLB card with 2MB of RAM and a GD-5429 chipset. All modes work as expected except as noted below. Driver required to be loaded. Will work on a real CGA card or a pre Tandy 1000 TLs and SLs, but not on the later 1000s. CGA games that use this effective resolution include Styx, Round 42 and Moon Bugs. Limitations include no cyan/red/white palette, no tweaked capabilities (background/border color, mid-frame palette changes). Use Tandy, EGA or better 320x200x16 modes to show the cyan/red/white palette and tweaks. Border colors will never be shown. No support for changing foreground color with real CGA or entering color composite mode. Use Tandy 1000 Mode 640x200x4, Tandy TL/SL or EGA Mode 640x200x16 for showing foreground colors other than white. Not many games use a pure CGA 640x200x2 mode, some can choose it as an option like Wizardry and SimCity. Should be used for Tandy 1000/PCjr. Mode 08 160x200x16 as well, use /J1 as a command line argument to gain access to this mode. EGA Mode 320x200x16 can show these 160x200x16 and 320x200x16 screenshots. Rarely used, use /J1 as a command line argument to gain access to this mode. Great if you want to show off graphic screenshots in PCjr. ColorPaint or Tandy Personal Deskmate 1-2, but otherwise almost never used. Available on Hercules monochrome graphics adapters. Better adapters do not tend to show this mode well. Driver required to be loaded, can display EGA Mode 0E 640x200x16 graphics perfectly and CGA Mode 06 640x200x2 graphics with a colored foreground. Very few games use this mode directly and it is never ideal. Sargon III and Star Trek 25th Anniversary allow it to be selected. Can display Tandy 1000 TL/SL 640x200x16 graphics perfectly and CGA Mode 06 640x200x2 graphics with a colored foreground. Use this mode to display CGA Mode 06 640x200x2 properly with a VGA card. Mainly used by ports of Japanese PC games and some LucasArts and Sierra games for those few people without VGA cards. Will be available only on a EGA card attached to a monochrome TTL monitor. Rarely used, but SimCity and Microsoft Flight Simulator 3.0 do support it. Will be available only on an EGA card attached to a 350-line color TTL monitor or by using a VGA card. The original SimCity's best graphics mode and also used for the title and menu screens in the early Lemmings games. Takes the place of CGA Mode 6 640x200. Supported by SimCity and not much else. Not very popular due to the color limitations, Supported mainly by Syndicate. 320x400 had some popularity, System Shock supports it, but 320x240 was a more common non-standard resolution. 360x480 was pretty much the maximum resolution vanilla VGA could support, but was used by shareware and freeware games. If you have a 320x240x256 VGA Mode-X screenshot, you should be able to set perfect results using 640x480x256. The program supports many SVGA chipsets as well as the usual VESA modes. It identified my VLB card's chipset accurately and was able to display all the above resolutions and color depths in the setup test program. I found that CompuShow really preferred interlaced GIFs. It would show minor drawing errors if it displayed PNGs, GIFs or PCX files using the Tandy graphics adapters. With interlaced GIFs, pictures will display correctly every time. Many, many programs can convert PNGs to GIFs. I use InfranView to perform the conversion, and the program will allow you to convert to the interlaced GIF format. While CompuShow will also convert PNGs to interlaced GIFs, InfranView can do so with the horsepower of a modern machine and can do multiple files in batches with ease. DOSBox will save a 640x200 resolution or 160x100 CGA screenshot as 640x400 pixels. Similarly, Tandy/PCjr. 160x200 resolution screenshots are saved as 320x200. Unusual VGA screenshots tend to be saved in aspect ratios that will give the image a squarish aspect ratio. You do not need resize the images, CompuShow will automagically disregard unnecessary duplicate lines and show the image as it was meant to be shown. On a real CGA adapter, if your screenshot uses the alternate palette colors, use the corresponding intense or non-intense cyan/magenta/white palette. If you select the wrong palette choice, the screen may draw very slowly as the program tried to interpolate colors and often the pixels will not look correct even with the wrong colors. If you are trying to display a screen capture of a text mode with colored text, EGA, VGA and Tandy TL/SLs have a graphics mode that is sufficiently colorful to handle the effective text resolution with 16 colors. Tandy/PCjr. can handle 40-column text modes in full color, but not 80-column text modes. CGA is too limited to handle either column width with full color. Hercules may be able to offer a passable rendition of text mode in graphics mode. Note that true VGA text modes have a 360x400 and 720x400 effective resolutions for for 40-column and 80-column text modes. DOSBox will save screenshots of VGA text modes in 320x400 and 640x400 resolutions, respectively, unless using the vgaonly machine type. These are the effective text resolutions of the MCGA adapter, which is a VGA offshoot. Even though Hercules has a 720x348 graphics mode, it will not show monochrome text very well, even though the monochrome text Mode 07 has an effective resolution of 720x350. Also, monochrome text can use intense and non-intense characters, but monochome Hercules graphics can only show non-intense pixels. Ironically, while CompuShow works very well with all sorts of hardware (I did not test it with the PCjr. yet), it does not work in DOSBox. It will complain that it cannot find its README.EXE, SETUP.EXE and CSHOW.DRV files, even though they are present in the same directory as CSHOW.EXE. Even booting real MS-DOS 6.22 will not prevent the error, which prevents the program from starting. Although the monochrome selections, A-G, are supposed to allow for light to dark shades of the color, it seems to have no effect in every system I tried. Maybe it is for a special type of CGA display. With my IBM PC and IBM EGA graphics adapter (upgraded to 256KB), the wrong colors would appear when using the 16-color EGA modes. The program did not detect an EGA card, and I believe this is because I was using a 200-line monitor with the card. So it can look like a CGA card. I had to force the program to use the EGA modes using the /Ae command line argument, but I got color errors. I got the same color errors when I forced the program to EGA on a VGA card. When I used the EGA modes without the forcing command line argument, the pictures displayed correctly. Therefore, I suggest that EGA will display these graphics properly on a 350-line EGA monitor and with the card configured for full EGA capabilities. I do not have a 350-line color monitor to test with unfortunately. When connected to my MDA display, the 640x350x2 graphics mode was available and displayed the screenshot correctly.